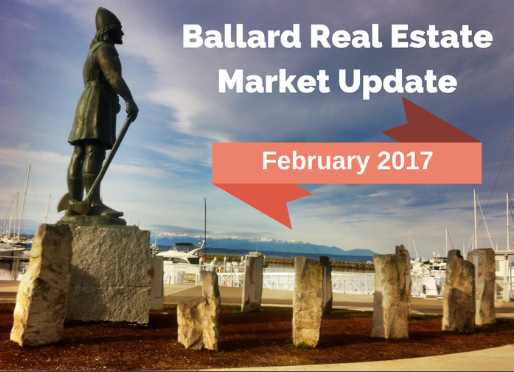 Time to take a look at how the Ballard Seattle real estate market fared during the month of February 2017. February is usually a month where the market is starting to emerge from winter hibernation. Or at least that used to be the case. Because of the chronic low inventory of homes for sale, Ballard and other Seattle neighborhoods are staying competitive all year round now. The market remains very strong and for the past few months, Seattle has been either occupying the top spot or near the top as the hottest real estate market in the country. The low number of homes for sale remains the main factor driving prices upward. The major difference between different times of year is the variation in the number of homes for sales that naturally cycles through the lowest number in winter and then builds up to peak activity in the spring and early summer months. The graphic below shows how homes for sale in Ballard Seattle compared in February 2017 versus 12 months earlier in February 2016. In February 2017, there was a total of 76 new listings (single family and condos combined) which was 11% lower than a year earlier. There was a big drop of 57% in the number of homes that sold. The average number of days that a Ballard home took to get an offer was 17, which is similar to last year (20 days). On average, homes in Ballard sold for 105% of list price which is up from last year's 103%. The median sale price for Ballard single family homes was $782,000 which was a 19% jump from last year. It is possible that this number is not reliable and that the average might be skewed by a larger proportion of high-end, more expensive home sales. Will need to see next month's data. Ballard condominium prices were up 9% from February 2016 with an average sale price of $478,00. What's the general price trend? The graph below shows the median sale price trend for both single family homes and condominiums over the past 10 years (using a 6-month rolling average). Note that the median price is the price at which half the homes sold above that price and half sold for below that price. After the 2007 "bubble", bottomed in early 2012 and have been increasing ever since. As you can see, Ballard home prices are well above previous highs seen in 2007. Currently, the median sale price is around $700,000 versus $500,000 previously for single family homes. For condos, it's now $400,000 compared to $330,000. Move your mouse over the graph to see sale prices. How is The Ballard housing inventory trending? The graph below shows how the number of Ballard listings has dropped over the past 5 years leading to greater competition for homes which then forces prices up. Good news if you are a seller but makes for a tough market for buyers looking to buy a property in Ballard. Currently, there is only about 1 month's supply of inventory available. Despite home prices increasing since 2012, there has not been an associated increase in the number of homes for sale. Have actually seen the opposite happening. What do the numbers mean for you? For sellers: based on current price and inventory trends, the Ballard real estate market is not showing any signs of slowing down and remains a very strong seller's market. Most homes, if priced properly (don't get greedy), should sell quickly with multiple offers and sell above list price. For buyers, it remains a competitive market and you will probably have to compete with other buyers for the best homes. You will need to be flexible on your offers and pre-inspections before submitting an offer are the norm at the moment. Pick your battles and only make offers on the homes you really want and be prepared to go all in. Hang in there! In order to generate more reliable data, I combined data for the 98117 and 98107 zip codes areas. Too few sales lead to unreliable data. Also, it is always better to look at the overall trends rather than focusing in on any one single month's data. In general, there is too much variation from month to month to make any reliable predictions. So, when you see headlines in the newspaper stating "home prices surged up 6% from the previous month", take that with a grain of salt and focus on the big picture trend.